New for September 2018: here's a page on the history of stripline. Stripline, according to David Pozar's textbook "Microwave Engineering" was invented at by R. Barrett in the 1950s. Airborne Instruments Labs (Long Island New York, gone but spawned present day companies such as MITEQ) coined the term "stripline", while others such as Sanders (Nashua, NH, now part of BAE) applied the trade name "Tri-plate". Stripline is a conductor sandwiched by dielectric between a pair of groundplanes, much like a coax cable would look after you ran it over with your small-manhood indicating SUV (let's not go there...) In practice, "classic" stripline is usually made by etching circuitry on a substrate that has a groundplane on the opposite face, then adhesively attaching a second substrate (which is metalized on only one surface) on top to achieve the second groundplane. Stripline is most often a "soft-board" technology, but using low-temperature co-fired ceramics (LTCC), ceramic stripline circuits are also possible. All kinds of interesting circuits can be fabricated if a third layer of dielectric is added along with a second interior metal layer, for example, a stack-up of 31 mil Duroid, then 5 mil Duroid, then 31 mil Duroid (Duroid is a trademark of the Rogers Corporation). Transmission lines on either of the interior metal layers behave very nearly like "classic" stripline, the slight asymmetry is not a problem. Excellent "broadside" couplers can be made by running transmission lines parallel to each other on the two surfaces. We'll add more about this later! Other variants of the stripline are offset strip line and suspended air stripline (SAS). For stripline and offset stripline, because all of the fields are constrained to the same dielectric, the effective dielectric constant is equal to the relative dielectric constant of the chosen dielectric material. For suspended stripline, you will have to calculate the effective dielectric constant, but if it is "mostly air", the effective dielectric constant will be close to 1. Stripline is a TEM (transverse electromagnetic) transmission line media, like coax. The filling factor for coax is unity, and "Keff" is equal to ER. This means that it is non-dispersive. Whatever circuits you can make on microstrip (which is quasi-TEM), you can make better using stripline, unless you run into fabrication or size constraints. Stripline filters and couplers always offer better bandwidth than their counterparts in microstrip, and the rolloff of stripline BPFs can be quite symmetric (unlike microstrip). Stripline has no lower cutoff frequency (like waveguide does). Another advantage of stripline is that fantastic isolation between adjacent traces can be achieved (as opposed to microstrip). The best isolation results when a picket-fence of vias surrounds each transmission line, spaced at less than 1/4 wavelength. Stripline can be used to route RF signals across each other quite easily when offset stripline is used. Disadvantages of stripline are two: first, it is much harder (and more expensive) to fabricate than microstrip, some old guys would even say it's a lost art. Lumped-element and active components either have to be buried between the groundplanes (generally a tricky proposition), or transitions to microstrip must be employed as needed to get the components onto the top of the board. The second disadvantage of stripline is that because of the second groundplane, the strip widths are much narrower for a given impedance (such as 50 ohms) and board thickness than for microstrip. A common reaction to problems with microstrip circuits is to attempt to convert them to stripline. Chances are you'll end up with a board thickness that is four times that of your microstrip board to get equivalent transmission line loss. That means you'll need forty mils thick stripline to replace ten mil thick microstrip! This is one of the reasons that softboard manufacturers offer so many thicknesses. Time for another Microwaves101 Rule of Thumb! This one was contributed by an Yaroslav, from beautiful Butler, New Jersey. 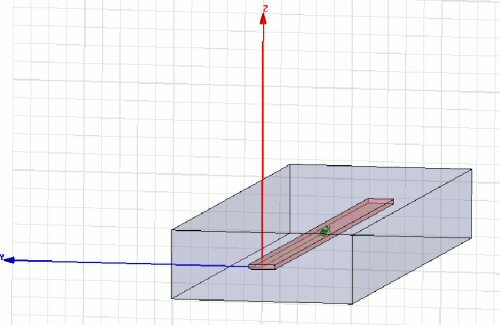 The minimum width for a stripline that is encased by metal on the edges is 5 times the line width, in order for the impedance to calculate with the "normal" closed form equations. 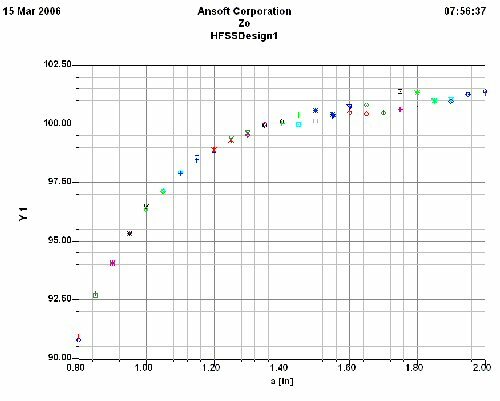 The drawing below is a 3D electromagnetic model of stripline with perfect electrical conductors encasing all four sides along the z and y axes (created using Ansoft's HFSS). The width of the stripline is 0.284 inches, its thickness is 0.050 inches, the height of the enclosure is 0.750 inches, and the relative dielectric constant of the material is 1 (it's air). The width of the enclosure was varied to examine its effect on characteristic impedance (see figure below). 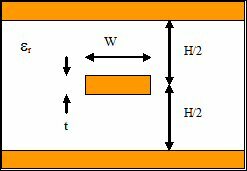 As the width increases, the impedance increases (less fringing capacitance to the edge walls), but the rate of increase eventually reduces to zero when the enclosure becomes infinitely wide (the enclosure becomes two parallel plates). The goal of this design was to determine the dimensions for a 100 ohm transmission line, which happens to occur near a width of 1.4 inches. Coincidentally, the 5X width rule is 1.42 inches. Past the 5X width point, the impedance only changes about 2% all the way out to infinity. An error of two percent in impedance is so small it is usually negligible. After all, it represents a voltage standing wave ratio (VSWR) of only 1.02:1! For grins we tried the Microwaves101 stripline impedance calculator on Yaroslav's dimensions of 0.750 inch height, and 0.284 inch strip width. We calculated 114 ohms. Looks like our calculator wasn't all that accurate in this case, but we will look into this further. Thanks to David for helping us correct this in January 2014! We seem to have misplaced the reference for this equation, any stripline solution comes with a lot of caveats about what range of geometries it performs accurately. We'll try to dig that up one of these days. Try out our stripline calculator!